First off, you should know that I’m not typically the synth player. I’m actually the lead audio engineer as well as one of the two drummers we have, so I’m rarely behind a (musical) keyboard on Sunday mornings. My goal here is to have a fail-safe, fool-proof synth setup that can be run by any decent keyboard player. That’s part of the reason I’ve gone with MainStage instead of Ableton Live or Reason: although Live is my personal favourite, and Ian McIntosh of Jesus Culture swears by Reason, MainStage is by far the most foolproof. Subjective, but if you’re just starting out I’d really recommend you look at MainStage, both for price (you really can’t beat $29.99) and ease of use. Here at Harvest we use an M-Audio Axiom 49 as our MainStage controller and lead keyboard. I like to keep lead sounds on a seperate keyboard because it keeps the musician from having to fiddle with knobs and faders every time a lead part comes up. Simplfication is good! Besides the Axiom we use a Yamaha P-115 as the primary keyboard for all pads, keyboards, bells, etc. We run all our sounds off a 2015, 13″ MacBook Pro through a Focusrite Saffire PRO 24 FireWire audio interface. I went with the Saffire PRO becuase I really believe that it’s best to avoid using the same bus for control and audio. If you’re using a USB audio interface, there is a chance some USB issue with your controller is going to effect the audio signal chain. I’ve used tons of interfaces over the several years and I’ve always found FireWire (or Thunderbolt if you can afford it…) to be much more reliable than USB. Just my 2¢. I went with something with a lot of outputs because I like having the flexibility of running different sounds back to the front of house engineer as seperate channels, instead of cramming everything into a stereo bus. Tip If you can manage it, more channels is better: give your front of house engineer as much to work with as possible! There are so many controllers out there and most of them offer a lot of the same. I like the P-115 because it’s a low-cost keyboard that has a great feel, which is still very important to most keyboard players. The onboard samples aren’t great at that price point, but we’re not using them anyway. Find a keyboard that has the feel you like and the number of keys you need for the lowest possible price. You can always drive high-end samples with MainStage. Whatever you get, make sure you get something with at least a few hardware knobs and/or faders. The Axiom is a great, relatively cheap keyboard with a lot of hardware controls. I know you can just reach over and use the trackpad to control MainStage, but usually the extra time spent fiddling with the mouse is frustrating, both for the audience waiting for you to start that next song and the musician sweating behind the keyboard. Tip Give yourself hardware control for parameters you know you’re going to be changing often. Being able to access commonly-used settings quickly is a lifesaver in a live setting. I already mentioned we use MainStage to host our sounds, but we also use a ton of the plugins from Komplete by Native Instruments. It’s an expensive bundle, but very worthwhile if you can swing it. If you don’t have the budget for the whole thing, then (for worship) I’d recommend Massive, FM8 and Kontact in that order. 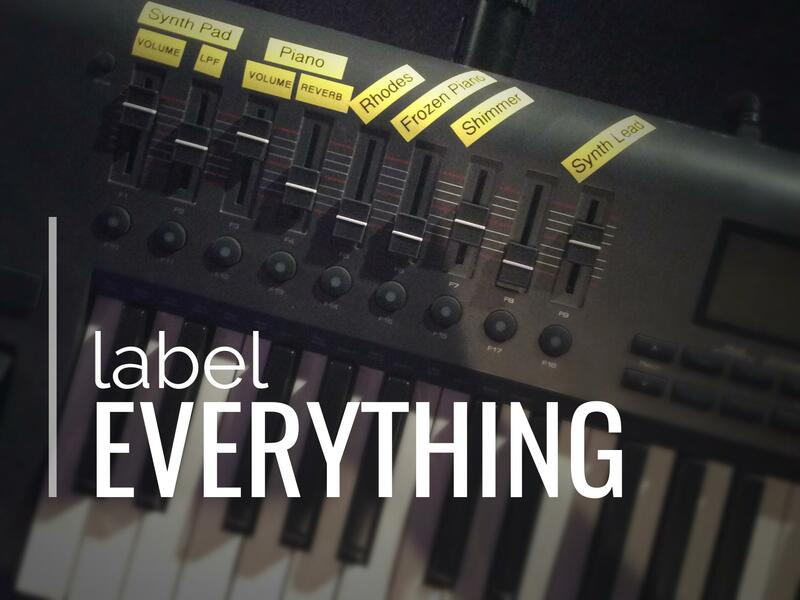 All our synth pads come from combinations of Massive and FM8, and all our keys are from Kontact. We also use Battery to launch drum samples which I’ll talk about a bit more some other time. If you take a look at my MainStage set you’ll see I only have one patch. I went back and forth on this and decided that the best option was to give the keyboardist all the instruments they may need on a single patch, and let them mix the sounds as needed. Although in theory having a seperate patch for each song would be great (and it would definitely help keep levels consistent), I found that maintaining every patch was tricky, and the lack of flexbility sometimes got in the way of what the keyboardist was trying to do. Find what works best, but I’d recommend starting with a one-patch setup, and creating presets from there if you find you are often using the same settings for multiple songs. Caution putting all your sounds into a single patch and mixing them uses a ton of CPU! This is because your CPU is generating all the sounds every time you press a key, even if you have the output turned down for that channel. Someday I’ll get to the point where I can put the MacBook off stage somewhere so nobody can touch it. I’m not there yet, but I’m pretty close: the less we have to reach for the trackpad the better. Hardware controls are more precise, easier to reach, and much less prone to mistake. So, as long as you can read, you’re pretty much good to go. Also you can access everything you need without using the trackpad. I also find that giving yourself lots of well-labeled hardware controls allows you to be more expressive: you can reach up and tweak the LPF on that pad or the reverb on the piano if it’s just not sitting right with everything else. You never know exactly how your live set is going to go, so give yourself lots of options. That’s about it! Leave a comment below if you have any questions and I’ll do my best to answer as quickly as possible. Thanks for reading!